It's another dramatic shift in US foreign policy, and one that's fast drawing international condemnation. President Donald Trump said on Thursday (March 21) it was time for the United States to fully recognise Israel's sovereignty over the disputed Golan Heights. The territory was captured from Syria in the 1967 war, then annexed by Israel in 1981, in a move not recognised internationally. Israel says Syria's civil war, which broke out in 2011, has made the fertile plateau an all the more precious buffer protecting Israel from its unstable neighbour. Trump's latest declaration, which would reverse decades of US foreign policy, is likely to further fuel anger across the Middle East, both in countries that are hostile to Israel and in others that are allied to the United States. It follows Trump's move in December 2017 to recognise Jerusalem as Israel's capital – a declaration that also sparked international outcry as the city's disputed status remains at the heart of the Israeli-Palestinian conflict. In a tweet, Israeli Prime Minister Benjamin Netanyahu thanked Trump for his gesture "at a time when Iran seeks to use Syria as a platform to destroy Israel". Analysts say Trump's move could help Netanyahu in the midst of a tough reelection battle. 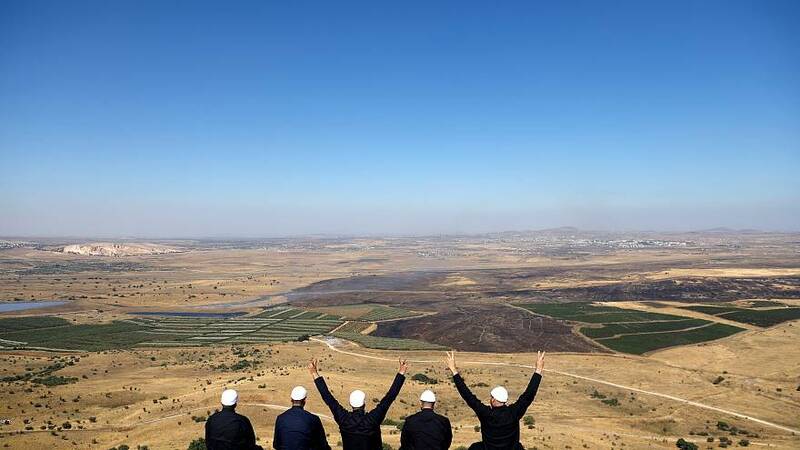 The Syrian government on Friday vowed to recover the Golan Heights, as its allies and enemies alike condemned Trump's comments. Iran, Syria's main ally in the region, called Trump's statement illegal and unacceptable. The Arab League said official US recognition of Israeli sovereignty over the Golan Heights would be "completely beyond international law". Turkey, an ally of the US who opposes the Syrian regime, said Trump's comments had brought the Middle East "to the brink of a new crisis". Russia, an ally of Syrian President Bashar al-Assad with military forces in Syria, said Trump's statement risked seriously destabilising the region, and it voiced hope that it was just declaratory. France said recognising the Israeli annexation of the Golan Heights was contrary to international law. Spokespeople for the German government and the European Union made similar comments, saying they did not recognise Israeli sovereignty over the territory. Our journalist Alasdair Sandford has a recap of the international reaction to Trump's move, and how it could stoke tension across the Middle East: watch his explainer in the player above.